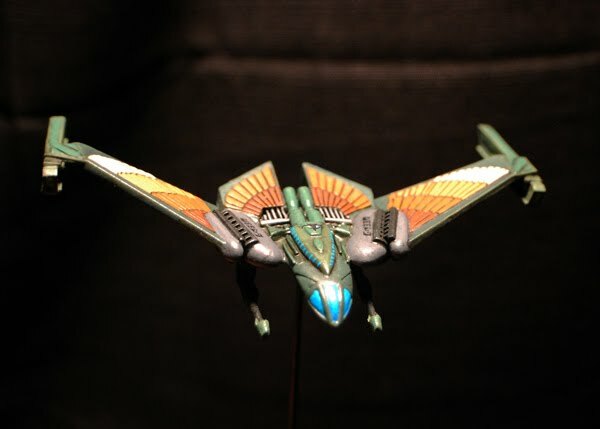 This was a quick and dirty little kitbash I threw together while I was working on my Njal cruiser. 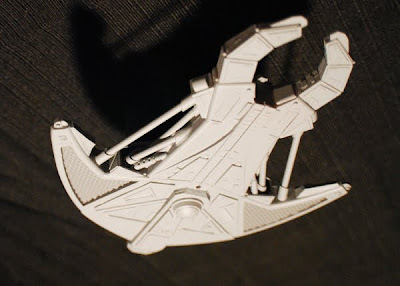 It's mainly the head and tail of an AMT Cardassian Galor kit spliced with pieces from the Klingon BOP kit and a couple of extra details added to help them blend together. 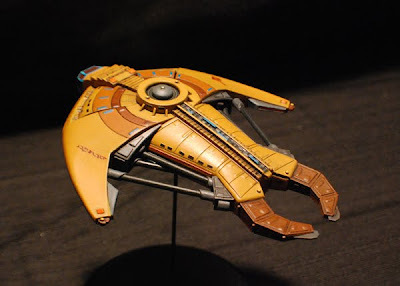 I decided to go with a totally radical color scheme for this ship completely diverging from the usual Cardassian Ochre and going to a more blue/gray scheme. 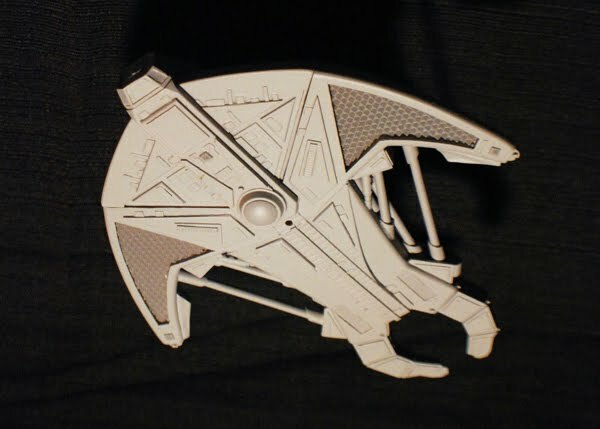 My logic behind this was based on the fact that this isn't a military ship, so it probably doesn't have to conform to the usual Cardassian Military painting aesthetics. Several layers of black wash and a few PNT Graphics decals later I have the finished product. 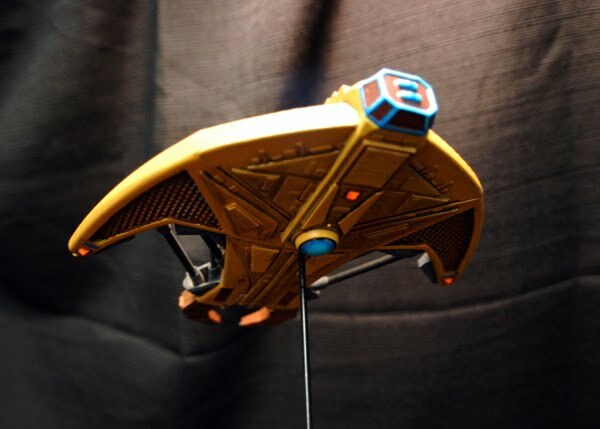 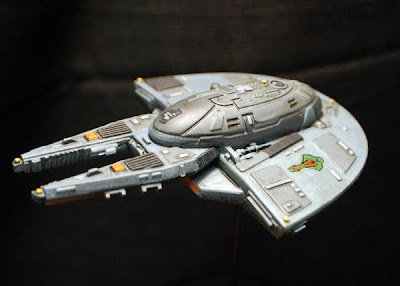 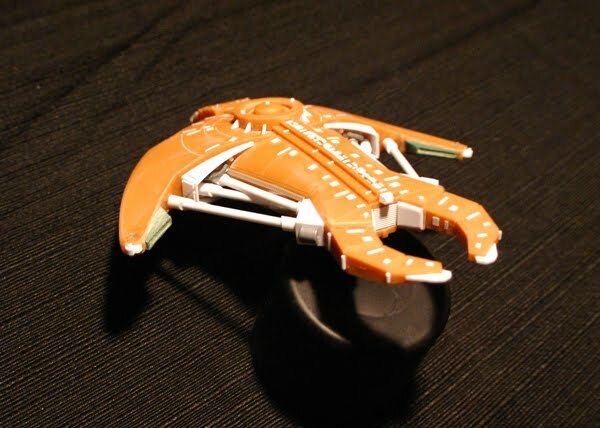 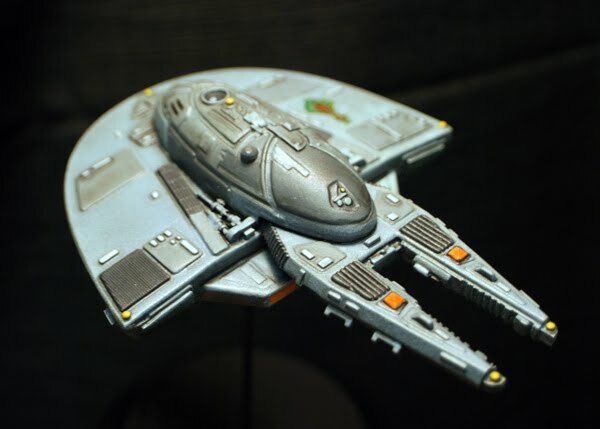 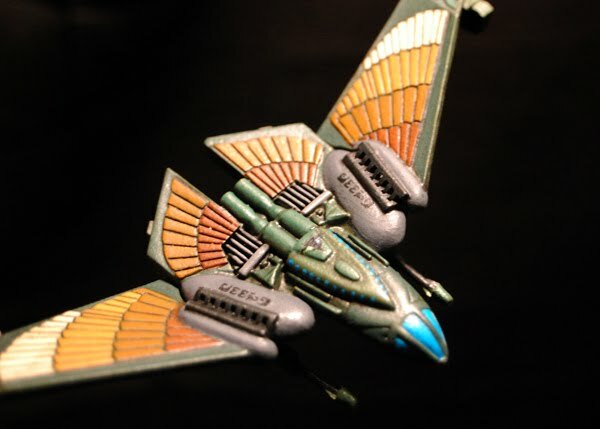 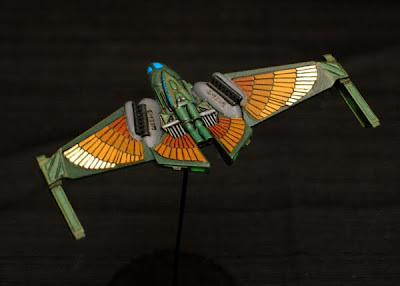 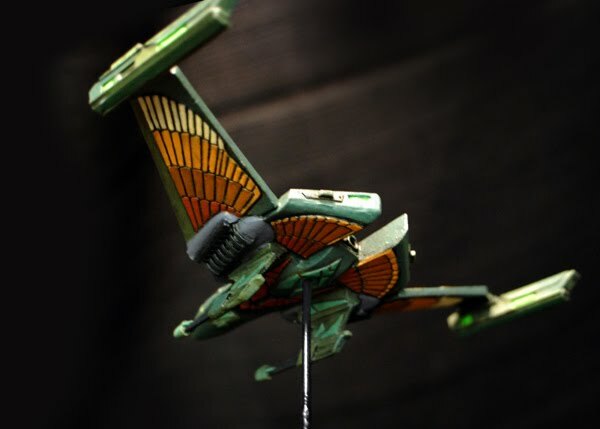 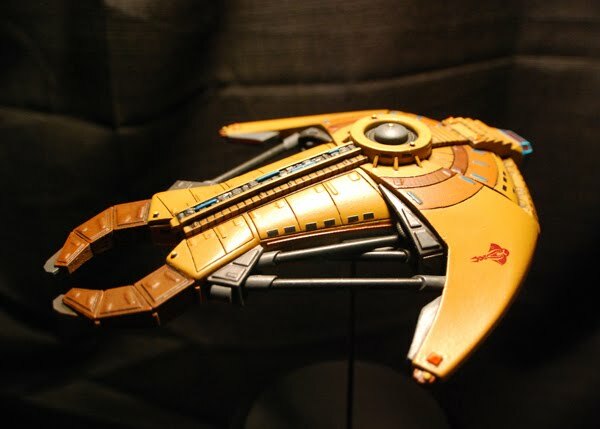 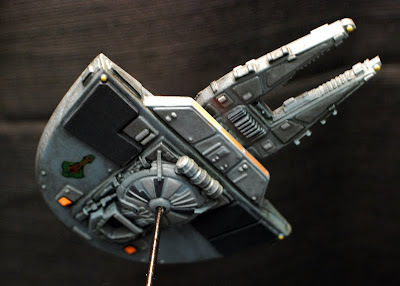 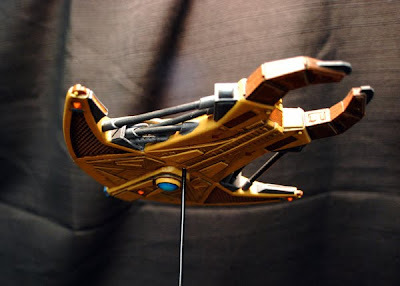 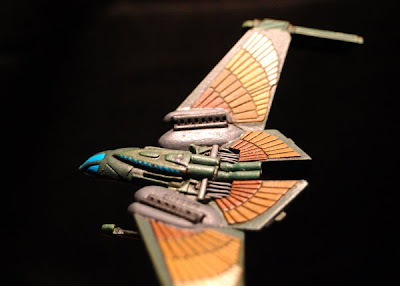 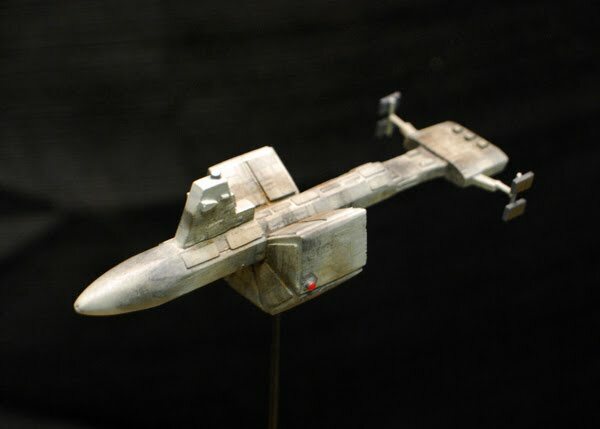 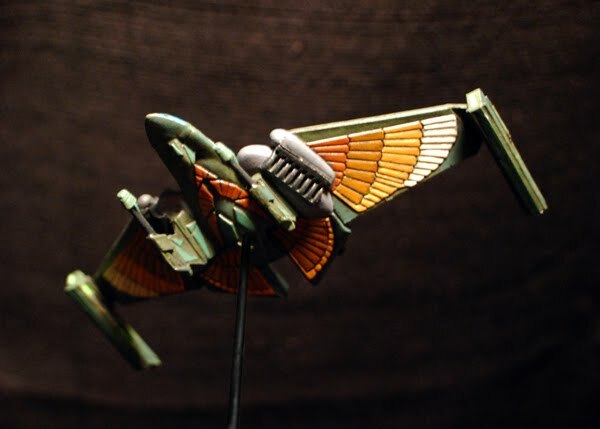 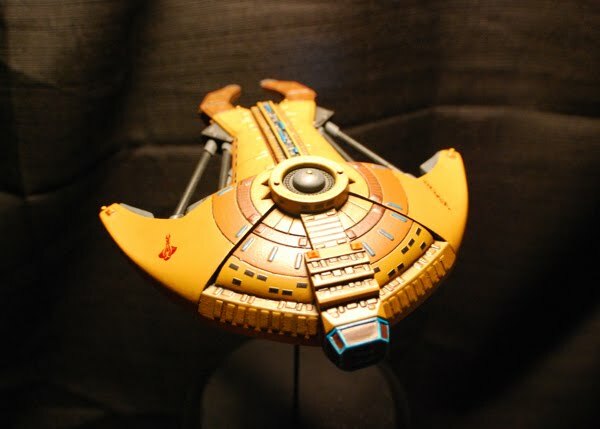 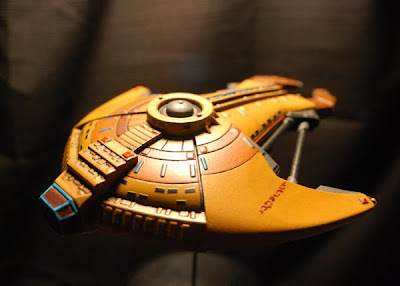 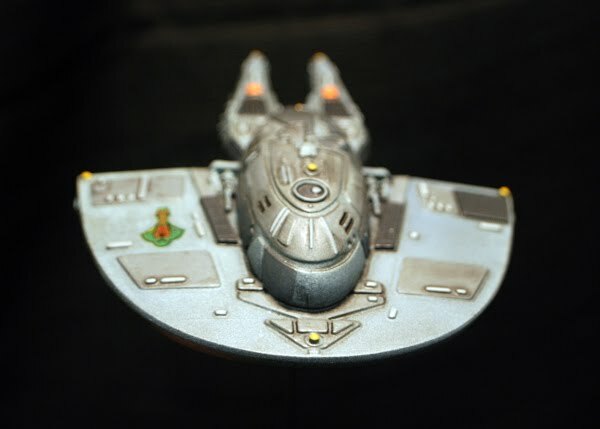 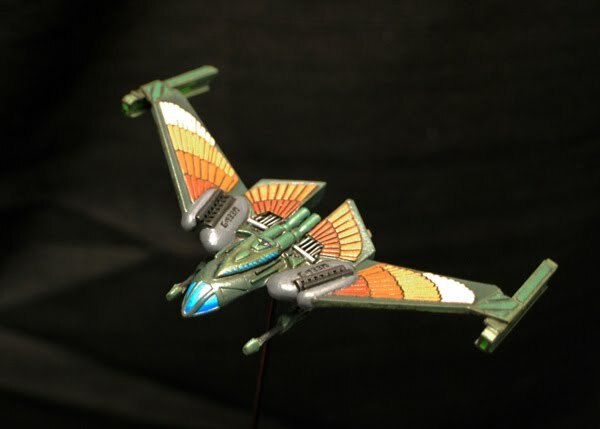 Here's some painted pics of my newly finished 1400 Cardassian Njal Class Attack Cruiser. The cruiser was painted with Tamiya & Testors spray paints, CItadel & Vallejo game color and a healthy amount of washes / drybrushing. 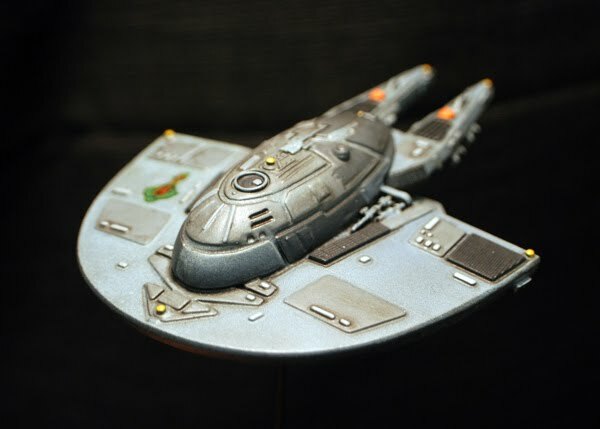 The Cardassian script was hand painted and the insignias were from a PNT Models Decal sheet. Quick update, just some primed pics. 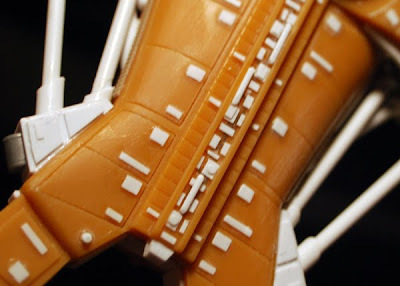 The detail really comes together now that it's even toned, however I see a few airbubbles in the resin I missed and a few areas where panel need more cleaning. 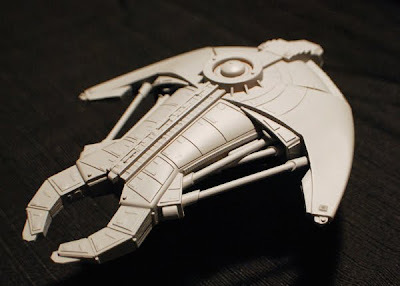 I just need to fix those, give it one more quick coat of primer, then the painting can commence. 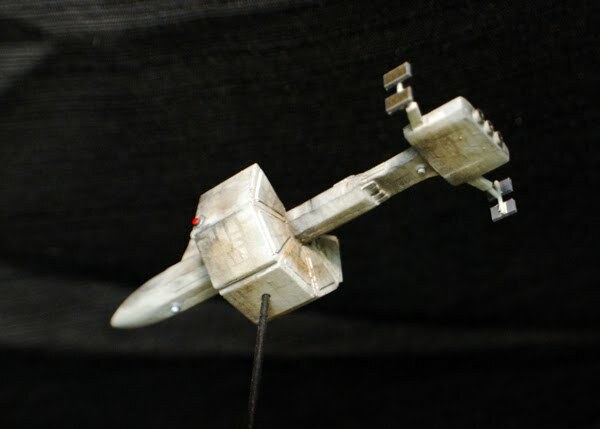 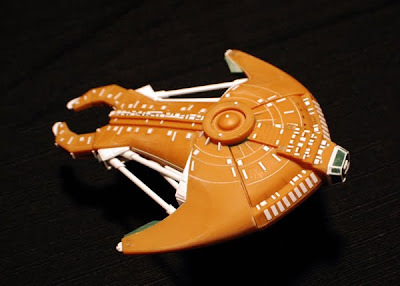 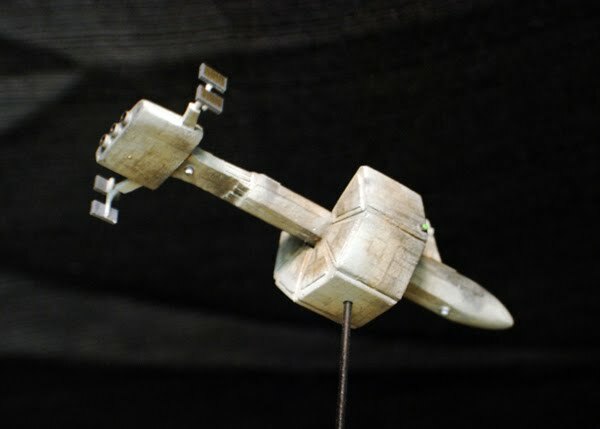 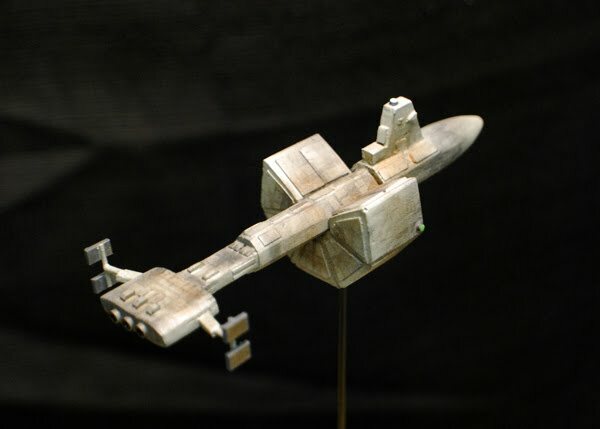 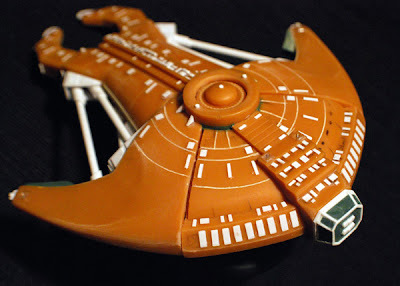 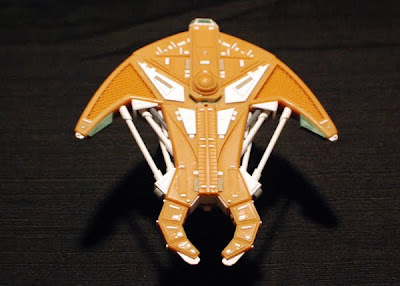 Recently I managed to win an OOP Federation models Cardassian Hideki class scout ship off of ebay. 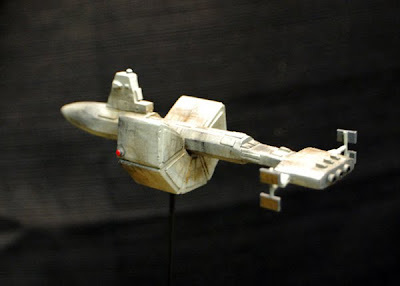 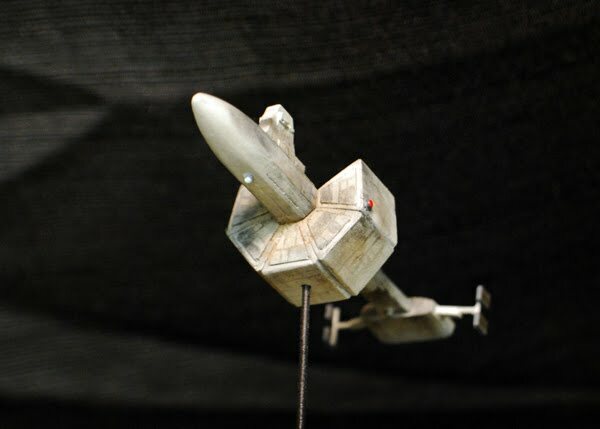 One of the first things I noticed about this model was the superb casting quality and the over all nice size of the model, however the detail was very inaccurate based on the reference I have of the studio model. 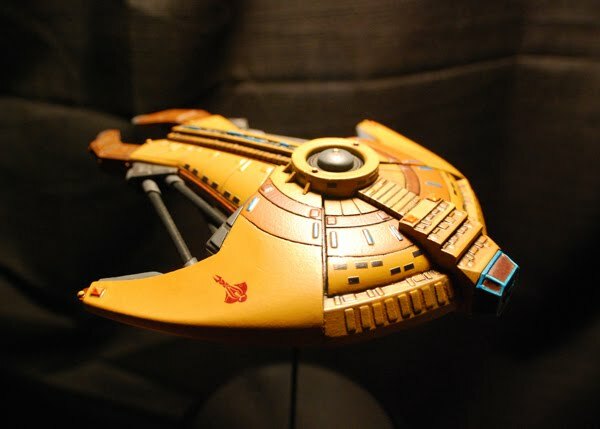 I still wanted to build the kit regardless but I decided to have some fun with it and make it into a smaller 1400 scale Cardassian vessel. The first thing I did was add much more surface panel detail all over the dorsal and ventral sides of the vessel made out of thin sheet styrene. 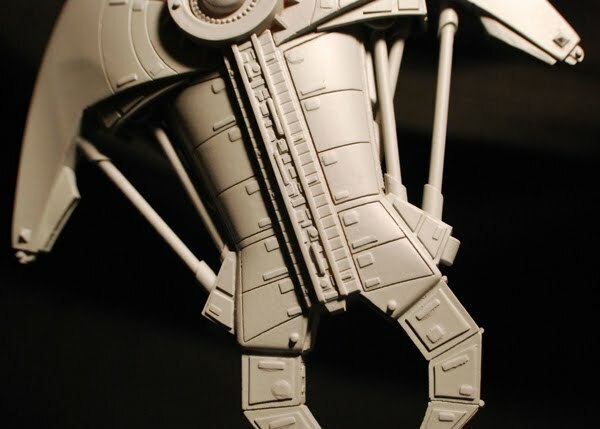 Tons of greebles were added to the dorsal sensor strip along the spine and built up a shuttle bay in the rear of the vessel between the crab claw. 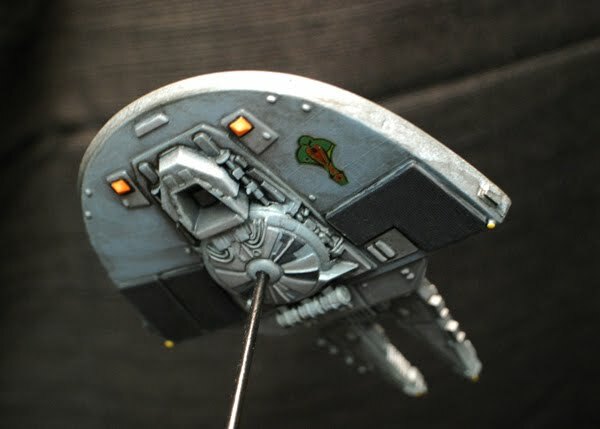 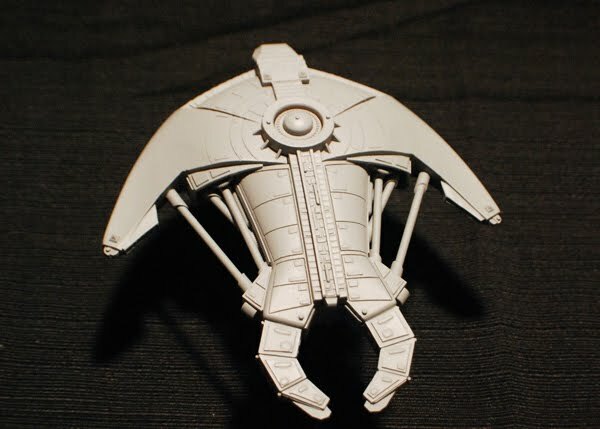 Circular panel lines were scribed on the top of the crab shell with styrene scribing tool mounted in a large compass and very small pyramid shaped disruptor pods were added from a regular AMT Cardassian Galor model I had lying around. I decided to add some crazy piping along the sides to bulk up the section behind the crab shell using interior sketches of DS9 as reference to mimic Cardassian pipe work with tube styrene. 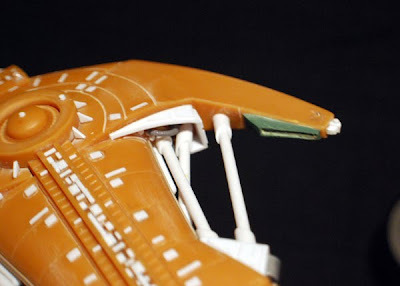 Then I built up some cowlings on either connecting end of the pipe work and added more greebles in the recess areas of the cowlings. 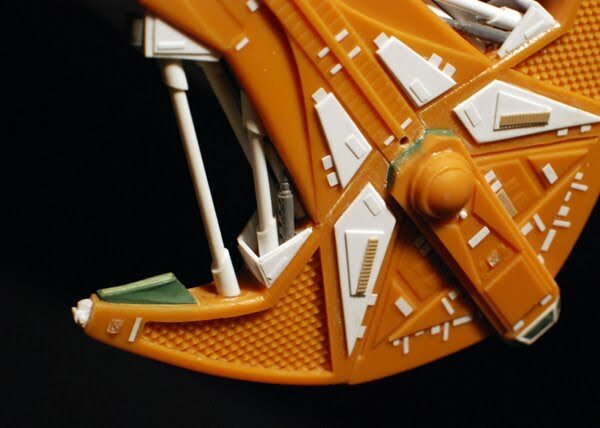 The front disruptor bank was where the cockpit used to be on the ship, but a cut slice with a Dremel tool and some sheet styrene took care of that. 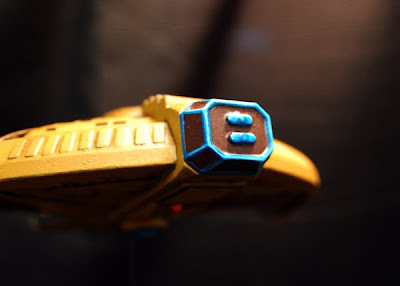 I made the disruptor bank itself out of Kneadatite putty and thin strips of sheet styrene. 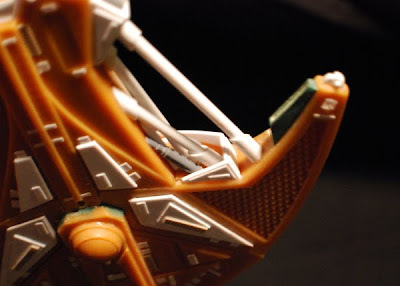 Kneadatite putty was also used to sculpt the impulse engines and fill in gaps around the bridge dome. 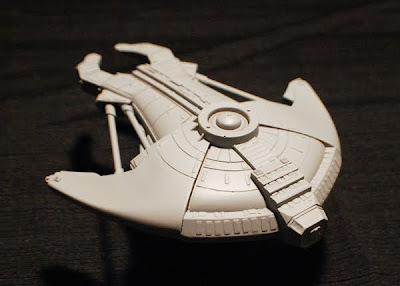 The next update will be of the vessel primed gray.